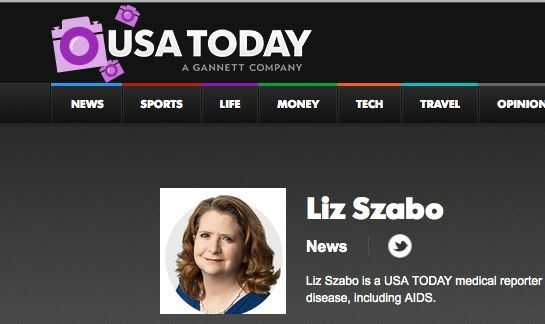 This is the second part of my interview with Liz Szabo about her investigation into the experimental cancer treatments of Dr. Stanislaw Burzynski. The first part was posted on Monday. Q: As you noted, the family whose son’s death prompted the FDA to halt Burzynski’s clinical trial had not heard anything but good things about Burzynski. Were there claims made about him that you pursued? A: As I looked at Burzynski’s endorsements, they fell through, either because they couldn’t be verified or because people apparently now don’t want to publicly be associated with Burzynski’s claims. His supporters like to quote some early supporters at NIH. For example, Dr. Dieter Schellinger. He is now elderly and said he has no memory of Burzynski. Dr. Nicholas Patronas is still at NIH, but did everything he could to avoid being quoted about Burzynski, and basically said any of his earlier comments were about preliminary work from the 1990s, and not meant to assess efficacy. I also tried to follow up with Reps. Joe Barton and Dan Burton, who held Capitol Hill hearings on Burzynski’s behalf in the 1990s. They were quite critical of the FDA for its take on alternative medicine at the time. Significantly, neither of them called me back. I wasn’t successful calling a researcher from Japan, H. Tsude, given the language barrier. But I emailed and faxed him, and he never responded. On the plus side, I did have a long phone conversation with the model Fabio Lanzoni, whose sister was treated by Burzynski for advanced ovarian cancer. She died, but Fabio remains quite positive about Burzynski. Unfortunately, his quotes were trimmed for space. Q: The FDA recently sent a warning letter to Burzynski. Did you get a sense while you were reporting the story that a warning letter was in the works or do you think your stories prompted the letter? I’m sure that letter was in the works while I was writing the story. The Texas Medical Board also has filed new charges against Burzynski, but they may have been in the works while I was writing, as well. Q: What has been the reaction to your stories? I imagine you are taking some heat from people who say he has cured their cancer or the cancer of a family member? The reaction has been pretty much what you would expect. The praise tends to come in early, because it’s genuine. The criticism comes later, partly because it’s orchestrated. I actually reported one threat to the local police and FBI. But here’s what’s important: I heard from many people who lost loved ones after going to the Burzynski clinic. A number of family members contacted me to thank me for writing the story. These people had horror stories about how their relatives’ fared after seeing Burzynski, and also about the financial costs. Their stories confirmed that there are real concerns here, and that we were right to document them. Q: How do you respond when people call you names or make threats? Criticism comes with the territory. I don’t respond to name-calling. As journalists, we’re professionals and should be above the fray. So I don’t enter into nasty online fights. But I try to see the humanity in everyone. If people email me and are genuinely concerned, or they feel their relative was truly helped by Burzynski, then I write back and try to engage in a constructive and civil conversation. If someone wants to give Burzynski credit for curing them, that’s their right. I try to emphasize what my readers and I have in common. And I think we can all agree it’s great when someone survives cancer. So I tell readers that I’m happy for them. One couple wrote to say that they are still hoping to see Burzynski, and they’re actually petitioning the FDA to get his trials reopened. It was difficult to know what to say to them. They are undeterred by all the criticism. They seem like nice people. I would hate for anyone to waste their money, and I would hate for someone to be harmed by an unproven therapy. But people have the right to choose their own course in life, and I hope it works out for them. Q: What would be your advice for people trying to report on disputed medical claims like this? Please do the research. Check the claims. Ask for data. Examine the data. Don’t rely on anecdotes, which can be incredibly powerful but also tremendously misleading. And ask reputable, independent experts for their take. This isn’t really a disputed medical claim. It’s an unproven medical claim. I really hope that other reporters will note that in their reporting. There was a lot of coverage about Burzynski’s battle with the FDA in the 1990s. Most of it was pretty balanced. Since then, however, there’s been relatively little written about him. Most of the recent stories appear to have been written by community reporters, writing features about patients hoping to raise money. These patients are all good, wonderful people, so it’s only natural that reporters at local papers want to help them raise money, such as by publicizing their chicken dinners, T-shirt sales or raffles. But it was a bit disheartening to see how few of these reports included any context about Burzynski. In most of the reports, he was described as a wonderful, maverick doctor with the secret to cancer. Sure, that’s one side of the story, and it’s fine to include that perspective. But it’s just inexcusable to leave out the 36 years of controversy surrounding this guy, which can be found with a few seconds of Web searching. I know we’re all busy and editors are making impossible demands on our time. But remember that you have a responsibility to your readers. How will they act on what you write? Are you helping someone to take advantage of a desperate patient? Are you providing free publicity to a questionable provider?